We’re so happy you found us! Welcome! “We” are Raymond Hines and Bernadette King. We’re best buds who met along Ray’s journey (he calls it a dance) with Meniere’s. For anyone who’s interested (or bored LOL) our strange but true story is posted below. We created the site so you can connect with others who understand what you’re going through. Also, so you can learn all about Meniere’s symptoms, treatment, diet, causes, triggers, and more. Here you’ll find any information we can get our hands on. From Western Medicine to Eastern Medicine to holistic, natural, alternative and metaphysical we leave no stone unturned in our efforts to bring you any and all possibilities for support and healing. Finally, please join our Meniere’s Forums. It completely free! We created them to provide a warm home on the web for you to lean a shoulder on, share your tips, experiences, and tears with other sufferers. Like we say, you’re not alone, especially not here. If Ray were telling his story, it would be pretty basic; he’s a regular schmo living the proverbial American dream. Ray would leave out little details like, he’s profoundly deaf and has been since birth. By definition, a person with profound hearing loss cannot hear any sounds without the help of amplification and even then the ability to hear anything can be minute. Misdiagnosed for the first year and a half of his life, a crucial time in child development, Ray has managed to master a couple of skills most profoundly deaf persons never do. He lip reads with freakish accuracy and speaks with clarity, intonation and uncanny timing. Ray’s parents decided early on they would do whatever it took to integrate him into mainstream society. As luck would have it, Ray’s innate personality lent itself perfectly to this goal. For some years Ray lived your average life; was a hubby, a dad, owned a computer repair and website-building business and founded his beloved company Gator Country Multimedia, Inc. (GC). He had some ups, he had some downs. It’s when those ups and downs started to become physical and spin out of Ray’s control that the problems started. The first half-dozen episodes – the projectile vomiting accompanied by dry heaving that went on for hours, the vertigo and fatigue that only a day spent in bed would get rid of – Ray chalked up to extreme food poisoning (remember, he’s red and hard headed). There came a day however, when after a “food poisoning” episode took over a week and a half to subside, Ray had to face the very real possibility that something was drastically wrong. “This was the first time I got really scared about all this in the middle of the attack. I felt so helpless, and really confused. These attacks made me feel like I was on the abyss of nothing — I was so disoriented that even when I closed my eyes, the spinning wouldn’t stop. It seemed like the spinning would go on forever and ever. That was when I got scared and couldn’t wait for my wife to get home from work (I work at home). It was just awful and really hit me emotionally and mentally. His quest to find answers was arduous at best. Some physicians told him it was an emotional issue, others garden variety vertigo. Because Ray is so independent and has always been the king of research, he found he was able to allay the attacks a tad by cutting his salt intake by 90% and consuming whole and organic foods rather than the highly processed diet computer geeks are infamous for. 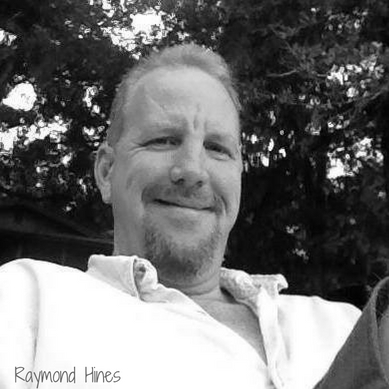 Eventually, Ray received the final diagnosis; Meniere’s Disease. Before he and his family could breathe a sigh of relief because a diagnosis means moving forward with a cure, right – the doctor’s next sentence was “@e don’t know what causes it and we don’t know how to cure it but there are several experimental…” and blah, blah, blah was all that Ray lip-read after that. “No reason why it’s happening to me and no cure.” he thought. “I don’t like that. I’ll figure it out.” And try he did. For the next few years Ray desperately sought for solutions; all while trying to helm his company (Gator Country Multimedia, Inc.) and be a good husband and father. True to Ray’s style, his heart and mind instantly went to everyone else’s needs first and he founded another website – Menieres.org. Ray’s fight to heal went about as badly as things can go. Because he’s deaf, he couldn’t just pick up the phone and call for answers, his (then) wife had to do it for him. No matter where he turned, no option to stop the attacks seemed viable and all were experimental. Ray swore his (then) wife and daughter to secrecy. He didn’t want the rest of family to worry, plus he was terrified that if word of his illness got out to the public it could compromise his business in some way and the company supported not only his family but staff and their families. The more the stress piled up the more the attacks came on. For almost three years it went on. One evening, with the effects from yet another attack lingering, Ray broke down and wept in front of his wife and daughter, telling them he “couldn’t take it anymore.” At that point, he felt there were really only two choices left – One, a rather radical form of brain surgery where they cut the nerves to the ear permanently, or two, end his own life. At this point, Ray was simply too ill to run his company. He was barely able to cling to the small knot he’d managed to tie at the end of his completely frayed rope. Now, a family’s rope has multiple ends and Ray’s (then) wife was frantically grasping at hers. That’s when she looked for some comfort and guidance from a local spiritual mentor – OK, psychic medium. During their session, the psychic gave Ray’s then-wife specific information regarding Ray – information she couldn’t have possibly known as none of the parties had ever met before and nobody outside Ray’s immediate family knew. 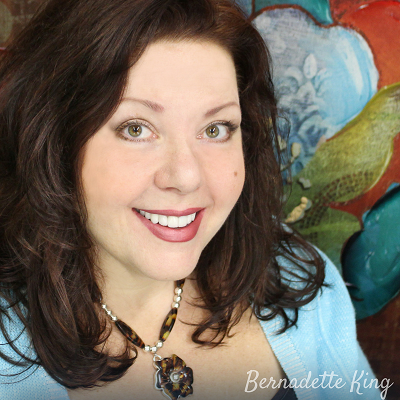 Two weeks later, Ray went to see the psychic – Bernadette King. Bernadette opened the door to a world Ray had only heard of but never considered. She spoke of energy centers in the body and the illnesses which can develop when they’re blocked. She explained how meditation and connecting to the energy of the Universe on a deeply spiritual level can heal many things. Basically, she hipped him to the kinds of things that cause mainstream folk to conjure up images of tie-dye clad, pot-smoking hippie types who bathe only when the buzzards start to circle and chant everything they say. Funny thing is, from that day forward, almost 11 years ago (as of 2018), Ray has not experienced a major vertigo attack. Now, let’s not forget how independent – ahem, control freakish – Raymond Hines truly is. He saw Bernadette’s crystal wearing, Nag Champa burning mentoring for what he thought it was – well-meaning words of encouragement and nothing more…especially the part where she told him that, psychically, she was picking up that something was critically wrong with the finances of his company and that he should look into it immediately. Nonetheless, something about that interaction compelled Ray. In the ensuing weeks he read day and night about energy healing and meditation, spirituality and world religion. Then Ray was sent to his knees, weeping when the forensic bookkeeper he’d hired found money missing from GC. Lots of money. At least Ray wasn’t alone when he was knocked to the floor that day. Two angels were on their knees right beside him, absorbing as much of the grief as they could and in more shock than he. You see, Ray really had somehow managed to keep his failing health and business secret, even from his parents. During the the next year Ray alternately worked on reviving GC and visiting Bernadette who was a catalyst in setting him on his spiritual path and ‘healing’ of Meniere’s. They talked, she served him organic french press coffee from the little cafe in the the metaphysical store that she owned and he became a regular there. Over the months Ray shed 100 lbs and started to regain his strength, health and pride. He replaced his guilt and feelings of failure as a husband, father, son and businessman with the faith that everything happens for a reason; that all involved in the story have had the opportunity to experience spiritual growth based on their individual choices made. One day he noticed that Bernadette wasn’t just all Chakras and sage smudgings. He observed that when she spoke, she had an understanding of and creative bent for big business that mirrored his own. Her comprehension belied the kitschy persona of the environment she’d cocooned herself in so she could do some energetic healing of her own. Ray inquired about her personal story. He lip-read it. Then he hired her as his COO at Gator Country Multimedia. Today Ray is as happy and whole as he’s ever been. He travels around the world in his Scamp trailer, exploring Mother Gaia and taking in all her wonders and magic. Been chased by a bear in Canada (and Bernadette had to call the Royal Canadian Mounted Police to rescue him – true story). Become a Reiki Master and an alternative healer. Camped or boondocked in almost every US state. 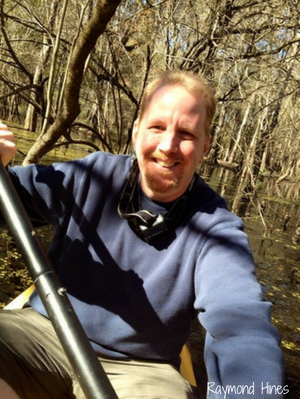 He is still the CEO at Gator Country but he’s found a beautiful work/life balance. Please visit him at his travel blog AlongTheRay.com. When she’s not in front of a computer, Bernadette’s seeking the best vegetarian/vegan food, craft beer, and deserts the world has to offer. Yes, she’s a foodie. 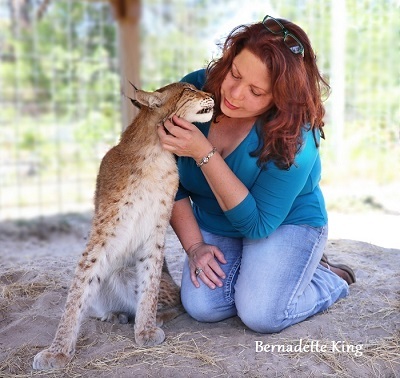 After finding great grub she’s off to teach or take a metaphysical class, give psychic medium and tarot readings, or visit/volunteer at an animal sanctuary. Ray handles the forums, Bernadette creates the content and together they wrangle the tech here on Menieres.org. We hope you understand we can’t answer any medical questions – those are best left for your doctors. If you’re not happy with your current doctor, always get a second opinion! It can’t hurt, but please keep in mind that Meniere’s Disease is very difficult to diagnose at times, and is also difficult to treat since it’s an incurable disease so far. We wish you happiness and healing.